Arriving at the Honolulu Airport? The Honolulu Airport Welcomes You! 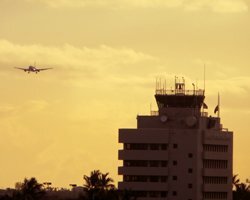 I decided to write about the Honolulu International Airport (Honolulu Airport for short or HNL airport code), because there are a few things that will be unique about your flight to Hawaii and/or your arrival on island. Unfortunately, because travel arrangements vary from person to person, I can’t give you an exact step by step guide to navigate your way off the plane and out to all the great Hawaii things to do. So I’ve basically compiled some random tips and helpful bits of information, which I’ll try to present as logically as possible. Speaking of welcomes… if you would like to arrange an airport lei greeting - CLICK HERE! (Link opens a new window/tab). 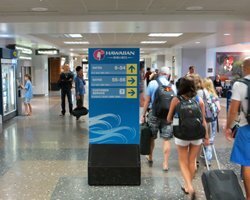 Before you can depart for the Honolulu Airport, you may need to figure out your airport transportation situation back home. I’ve recently come across a couple of great resources that could help you save a small fortune on airport parking… If you just need to park your vehicle for the duration of your Hawaii vacation, try this: Save On Airport Parking At Over 65 US Airports . They say they can save you up to 70%. Or, depending on your distance from the airport and the times of your flights, you might want to overnight in a hotel near your airport. If that’s your situation, this seems to be a fantastic deal: Reserve Airport Hotel for One Night & Get Up To 21 Days of Parking for FREE! 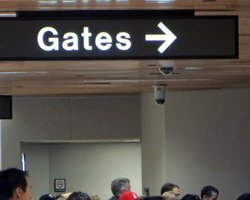 Unfortunately for me, neither of these services are available at the Honolulu International Airport, but that shouldn’t stop you from saving some cash! This does not apply to packaged foods, but it would include fresh fruits and/or flowers. Approximately one hour before your Hawaii flight lands (regardless of airline), the flight attendants will pass out a State of Hawaii agricultural declaration form, which basically requires you to report any/all organic matter you’re transporting (plants, animals, or agricultural materials, which could contain any number of microorganisms). Hopefully, you won’t be carrying any such substances. Then you can mark the box indicating “none” and be done with it. Be sure to pack a pen or pencil in your carry-on bag because they’ll give you the form, but they won’t give you anything with which to complete it. The form will then be collected by the flight attendants before you land. 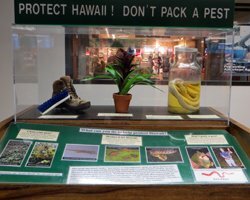 If you do have non-family-member biological organisms traveling with you, you’ll be required to declare them; and then you‘ll have to talk to quarantine officials located in the baggage claim area at the Honolulu Airport. I’ve never had to declare anything, so I don’t know for sure what happens from that point onward. I do know, however, that if you inadvertently (or perhaps intentionally) packed some flora or fauna that you then decide is unnecessary (or perhaps illegal), there’s an Amnesty Bin located right beside the doorway to Baggage Claim. You can dispose of the offending item(s) in those bins with no questions asked and no requirement to declare them. Please take this seriously. There are at least 377 species in Hawaii that have been identified as endangered; and dozens more have already become extinct. As a result, our islands have been dubbed the “endangered species capital of the world”. Meanwhile, flights continue to arrive at the Honolulu Airport from every corner of the world, which creates countless invasion opportunities for non-native species. And every new species that gets introduced to our isolated ecosystem – either through carelessness or selfishness – is a potential hazard for the native species that evolved without any natural defenses against the invaders. Paradise doesn’t need improvement… it needs protection. 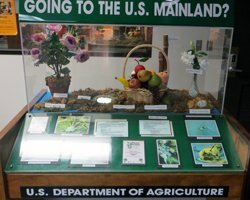 If you require specific information about how to properly transport plants, non-domestic animals, or organisms to Hawaii, call the State Department of Agriculture at 808-837-8413, or for domestic animals, call 808-837-8092. If you’re traveling with a tour group, you might be able to stop reading this page right here. Generally the tour group coordinators will meet you right at your gate as you exit the plane. They hold up their signs; and from what I’ve seen, they seem to help with every step of the process after that. I live here, though. So, obviously, I have no need of a tour group and can’t give you any information from first-hand experience. Just get instructions from your tour group coordinator and then follow their recommendations. 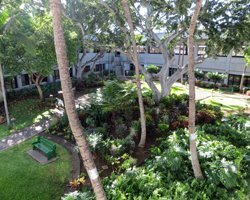 Just like at every other major airport, your arrival at HNL will probably begin with a bit of a walk from the gate to baggage claim. Personally, I’m ready to stretch my legs and breathe some fresh air by that point. But if you have difficulty walking and/or if you just can’t wait to get back into another crowded transport tube, there’s a free Wiki-Wiki shuttle bus that constantly runs from each terminal back to the main terminal (third level, above security and baggage claim). Just get to the sidewalk outside your gate and look for the nearest Wiki-Wiki Bus Stop sign. The shuttle will be around shortly to give you a lift (6am to 10pm). 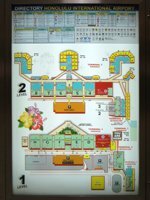 Click here to see a map of the Wiki-Wiki Bus route at the Honolulu Airport (opens a new window/tab). In the Hawaiian language, wiki means “fast”. So Wiki-Wiki basically means double-quick. I’m not sure that I’ve ever noticed this shuttle to be faster than walking directly to baggage claim; but it might save you some exertion getting to the inter-island and commuter terminals for a connecting flight. An interesting piece of trivia that I’ve heard… the Wiki Wiki Bus is said to have been the inspiration for the name of the very first wiki site: WikiWikiWeb. Since then, the term wiki has come to mean any user created/edited internet content such as that found on Wikipedia and Wikileaks. I don’t know if this is just local folklore, but it seems to be widely reported as fact. One of the key design features of the Honolulu Airport is the open-air walkways. You may like this or not; but I think it is an appropriate way to showcase our pleasant year-round climate – by letting you get out into it as soon as you arrive. There are also some nice gardens that you can enjoy along the way. Of course, on really humid days, I get anxious to find some air conditioning. Whether you’ve rented a car or you plan to hire a taxi, all you need to do is claim your baggage, exit the building, and cross the first few lanes of traffic to the aisle in the middle of the road. There you’ll find rental car shuttle bus stops and taxi stations. The rental car companies are almost all located right outside the airport. There are no tunnels en route to Waikiki or Aulani (unless you consider a freeway underpass to be a tunnel). If you find yourself going up and through a mountain, your taxi driver is just running up the fare. Average taxi fares from the Honolulu Airport to Waikiki range from $30-$45. Your best chance at getting the $30 fare is from a flat-rate service. Meanwhile, average taxi fares to Ko Olina Resort/Disney Aulani will probably cost you double those amounts. You should probably rent a car if you’re going to stay there, because there are only one or two attractions within walking distance of those resorts. Need a ride? Maybe you’d prefer a shuttle: Airport & Pier Transportation - CLICK HERE! (Link opens a new window/tab). If you‘re traveling to the U.S. mainland (continental United States), you’ll have to run your check-in luggage through an agricultural inspection before you turn it over to the check-in attendants and/or Transportation Security Administration (TSA) inspection agents. This is a very simple process. There are multiple inspection stations immediately before you get to the check-in counters. Just place your bags on the conveyer belt and let them run through the scanner. If you’re one of the last few people in the world who still uses film in your camera, you might want to make sure that it’s not packed in your check-in luggage. From what I recall, these X-ray machines are not film-friendly (it’s been a long time since I had any actual film, though, so I could be wrong about that). As soon as your luggage clears the agricultural inspection, they’ll put a sticker on your bag, and you can go to the check-in counter. Don’t go to the check-in counter first, because the airline personnel will only send you back to the agricultural inspection. Then you’ll have to wait in the check-in line twice. For reasons I have never understood, the agricultural inspectors always seemed to adhere their sticker all the way around your most-frequently-used luggage handle. And for many years, these stickers were practically permanent. If you tried to remove them, they tore into a thousand tiny pieces; and all you got was a sticky mess right where you would have to grab it for the remainder of your luggage life. Fortunately, the sticker they use at present is designed to wrap around the handle and stick only to itself. But I still have the gnawing suspicion that they occasionally try to get glue on your luggage handles anyway. Again, I could be wrong about that. What can I say? It’s the TSA. Generally, you can get through security in about 15-20 minutes. And then sometimes it takes 90 minutes or more. There’s never any explanation for the delays. They don’t seem to follow any predictable time patterns. My point is this… unless you’ll be flying from the commuter terminal, always get to the Honolulu Airport no less than two hours early. Hopefully this means you’ll have time to kill in the magazine and/or souvenir shops. And in a worst-case scenario, it will prevent you from missing your extremely secure flight. Just like downtown Seattle, it seems as if there’s a Starbucks on every corner in the Honolulu Airport. Other than that, the food court – if you can call it that – has very few choices; and most of them are your standard fast food places. So make sure you get your fill of all the great local foods before you arrive at the airport. Anything you buy after that will probably just be your basic sustenance. There are some electronics charging stations in the terminals and a few scattered outlets at the gates, but there are not nearly as many outlets available as I have seen in other airports. What there are plenty of, however, are souvenir shops. After all, you can never bring home too many boxes of macadamia nut chocolates! And maybe you’ll finally break down and buy that piece of Hawaiian jewelry you’ve been seeing everywhere. Basically, this illustrates what I believe to be the unofficial motto of the Hawaii tourism industry: if they build it, you will shop. (I don’t necessarily agree with that mantra, which is why I created this site dedicated primarily to free Hawaii attractions and activities.) Nevertheless, if you forgot to buy a souvenir for Aunt Glenda, you should have no trouble finding something at the Honolulu Airport.